Type your UPS tracking number below, get live delivery information with our express tracking system. United Parcel Service (NYSE: UPS) is a global leader in logistics, offering a broad range of solutions including the transportation of packages and freight, the facilitation of international trade, and the deployment of advanced technology to manage the world of business more efficiently. Headquartered in Atlanta, UPS serves more than 220 countries and territories worldwide. The company can be found on the Web at UPS.com and its corporate blog can be found at longitudes.ups.com. If you have problem with our express tracking system, please track your package directly on the UPS website. If you get no tracking information from UPS official website, you’d better contact them. 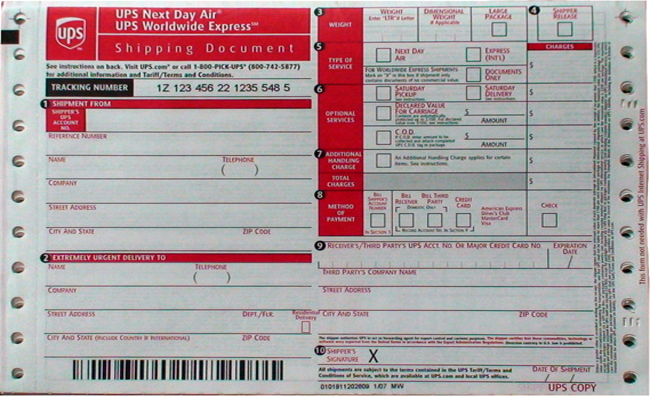 What is UPS tracking number Formats? Here is a waybill sample which shows the UPS tracking number is 1Z 123 456 22 1235 548 5. How Many Ways to Track UPS? Whether you use shipment tracking information to improve your bottom line or are simply looking for some peace of mind, UPS provides several methods to help you track your shipment's status. To use this helpful feature, select Track by Reference on the Tracking page. Indicate whether your shipment type is package or freight, select your shipment date range, and type your reference in the Shipment Reference field. Select the Track button to complete the process. Track a single shipment, or up to 25 shipments, by sending your UPS tracking numbers in an e-mail message. A detailed tracking response will be automatically returned to you. The Track E-mail address is [email protected]. To track a single tracking number, type the number in the subject line of the e-mail or in the body of the message. To track multiple tracking numbers, enter all of the numbers in the body of the e-mail message. You do not have to specify a subject for the e-mail.